Hmm. I wonder what would happen if….I push this. I cringe as a dozen screaming alarms go off, and stare blandly at the flashing red screen that is obviously trying to tell me something. “Susan, what did you do?” I hear a startled Galdornae over the intercom. “Okay…there.” I relaxed as things went quiet again. The screen was still flashing red. What’s a girl got to do to get a hot bath around here, anyway? “Yeah, get out if you can guys.” One of the other pilots replies. “Get safe. Go. Go. Go. 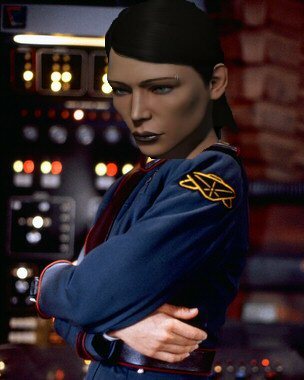 ” I watch as most of the friendlies on my sensors warp away. I try to engage my warpdrive to get away from the huge hostile fleet that just landed on us, and am unsuccessful due to strange ‘external factors.’ What the heck? I just replaced that drive a week ago. I’ll have to burn for the station instead. I switch on my afterburners and try to maneuver away from the ship that is jamming my warp signals, and toward the safety of the station. “Come on baby, you can make it.” I slowly drift toward the outer limits of the jammer’s reach, when he suddenly seems to notice me and brings his smaller, faster ship closer to get a better lock. “They’re jamming me, so I’m trying to get back to the station. 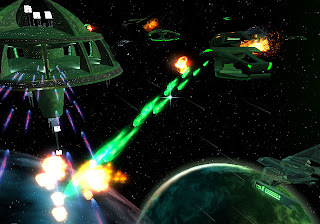 These guys are all over me, so I’m not sure I’m going to make it in time.” I say hurriedly, flipping a few controls and trying to squeeze a little more speed out of my slowly dying ship. I cringe as I notice that my armor has nearly been breached, and the hostile gunfire is slowly penetrating into my hull. “This is going to be a close one!” I shout as I slowly slide into range of the station. A few more meters and I’d be able to dock into its safe walls. I sigh with relief when I see I’m finally in range, and start punching buttons to trigger the docking sequence. “I’m in range!” I say happily over the com, and grin as I hear a few cheers on the other end. Her voice is cut off as my ship begins to explode. I walk into the grub hall to see that the rest of the crew has already assembled for their early morning breakfast after a long night of combat. “Herro.” I say glumly, going for a bowl of cereal. Tyrolen just looks up and waves, his mouth full of food. “Herro, Susan!” Bahamut answers cheerfully. Manos glares at me from behind the paper he’s reading. Gald is already in the engineering room when I come in, up to his elbows in grease while fixing a drone. I perch on a box and watch him tinker for a minutes. A small metal piece falls off the drone, and clatters to the floor. Gald lets out a short expletive, then retrieved it and tries to screw it back onto one of the drone’s metal plates. “Well, I had them installed last night before I was podded. I wasn’t going to use them quite yet…you know. I know I should only use them for some of our armor-heavy ships, and should jump into a different pod when I’m fooling around in shield stuff. But, I forgot. I didn’t forget at first….I actually thought to myself that I should probably change pods, but then I got distracted by that target….and needed to undock really fast…and it slipped my mind after that so when we went roaming I still had them plugged in.” My confession came out in a long gush. I stared at him for a few minutes, as he continued his tinkering. Then got up and walked toward the door. I hear another metal piece clatter to the floor behind me. Gald stood up and I cringe as I hear several other metal pieces fall to the floor as He gives the broken drone in front of him a hard kick. “This stupid piece of….” His words fade as the door swings shut behind me. I sank beneath the bubbling, purple water and sighed in relief as every muscle in my body slowly relaxed. Now this is why I had spent months trying to rig those microwarpdrives to interface with my bath tub. Pure, Jacuzzi style heaven. I knew I’d never live it down if anyone found out, so I had carefully kept it a secret. “Circle back around and check that gate again.” A voice popped up on coms. I had been listening to a scouting op for the past 30 minutes. For all everyone knew, I was in my ship, ready to undock at a moments notice. For now though, they sounded like they were handling things. They wouldn’t miss me. “Uhh..” DJ hesitated over the com. “I got a hit, but it wasn’t him.” DJ said finally….sheepishly. “Darnit, DJ. Did you probe yourself out again.” Someone piped up. There were several snickers, and I couldn’t help smiling myself. DJ didn’t answer, so we all knew the truth. “Guys, I think I have something over on this gate again. I’m going in.” someone else said. I sank lower in the tub, and closed my eyes. “I’m docking to grab something to eat.” DJ said finally over the coms. “Yeah, gonna go get something to drink.” Someone else said. There was silence for about ten minutes, and I felt myself slowly falling asleep. “Guys, there’s a hostile macherial on this gate!” an excited voice popped up on the coms. I became more alert for a second, then slowly started to drift off again. “Guys?” the voice asked again. Aha! We'll make an RPer out of you yet!